Straight, bright, beautiful teeth can be yours in only two visits with your cosmetic dentist, Dr. Gunnin. 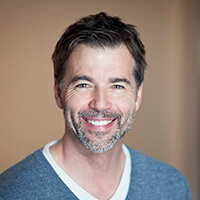 If your front teeth are chipped, cracked, discolored, or even slightly crooked, porcelain veneers can transform them to deliver the smile you've always wanted. Veneers, sometimes called laminates, permanent teeth whitening, or instant orthodontics, are thin layers of porcelain that cover each front tooth. These handmade restorations create a perfectly shaped, pearly white smile that looks totally natural. Veneers are also stain resistant, so you won't have to worry about staining. Dr. Gunnin will sit down with you to discuss your idea of the “perfect” smile. He'll review photos and refer to shading charts to determine the best color, shape, and style for your unique look. After preparing your teeth, he'll take an impression and secure your temporary veneers. Every porcelain veneer Dr. Gunnin designs is hand made by a talented dental ceramist. Your porcelain veneers will be crafted with quality dental porcelain that reflects light similarly to natural tooth enamel. In a final visit, you'll return to our office so that Dr. Gunnin can remove the temporaries and permanently secure your new veneers.